Panera Bread serves good food, food you can feel good about, can bring out the best in all of us. Food served in a warm, welcoming environment. They serve sandwich, salad, soup, and bakeries. They usually have free wifi and is a great place to study or have a meeting. 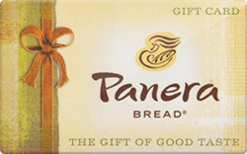 Buy a discounted Panera Bread gift card to save money on top of sales and promo coupon codes for the best deal.